Ruby Roman is a variety of table grape grown and marketed entirely in Ishikawa Prefecture, Japan. It is red in color and about the size of a ping-pong ball. 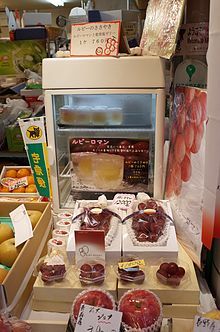 The first Ruby Roman grapes went on sale in August 2008 for 100,000 Japanese yen (US$910) per 700-gram bunch, or $26 per grape. They are said to be the most expensive variety of grapes. In July 2016, a single bunch of Ruby Roman grapes, containing 26 grapes at a weight of about 700 grams, sold for 1.1 million yen (around $8400) in the year's first auction at a wholesale market in Kanazawa. ^ "Bunch of grapes auctioned for $910 in Japan - Business - US business - Food Inc. - msnbc.com". MSNBC. 2008-11-08. Retrieved 2012-06-08. ^ Du, Lisa (2015-07-09). "Bunch of Grapes Sells for Record $8,200". Wall Street Journal. Retrieved 2015-07-09. ^ "Bunch of grapes sells for £8,350 in Japan". The Guardian. 7 July 2016. Retrieved 7 July 2016. ^ Ishikawa Pref (6 July 2016). "Ruby Roman grapes fetch record ¥1.1 million in season's first auction". The Japan Times. Retrieved 29 March 2017.